... do whatever they like and be free from the demands of others – actually focusing on caring for themselves. But this step often means being free from financial worries or concerns and for a large proportion of women, the prospect of a comfortable retirement can seem elusive. Especially when you do the sums. Women retire, on average, with $105,000 in super savings, which is $92,000 less than men, according to ASFA. 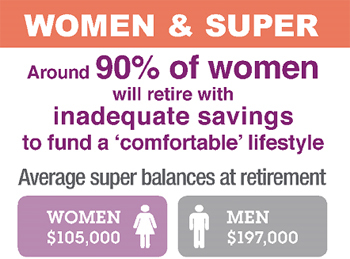 (ii) More concerning is that 1 in 3 women retire with no superannuation at all. The upshot is that around 90% of women retire with inadequate savings to fund a comfortable retirement. “Adequacy will also be a key factor, which is why we will continue to advocate for the Superannuation Guarantee (SG) to be increased to 12% as soon as possible,” said Ms Vamos. There are many reasons for the difference in super savings. Not consolidating super accounts, a lack of personal contributions, and even a lack of knowledge about how superannuation works are factors. For many women taking time out of the workforce for children or caring for others, has a massive impact. According to an American research report, (iii) women are likely to take an average of 12 years out of the workforce for family related reasons – and it’s likely the situation is pretty similar in Australia. When women return to the workforce, they often take part-time/low-paid or even free employment for several years to balance having a care-giver role as well. If you’ve worked in several jobs, you’re likely to have multiple super accounts and you can save fees by consolidating your super into a good quality, low fee super account. This could save thousands in unnecessary fees, which over time can make a big difference. Also note there is more than $14 billion (iv) in lost super and some of it could be yours. To find lost super, go to www.ato.gov.au/Super and then ‘Find your lost super’ tab.